RIT researcher Mishkat Bhattacharya is building a theoretical framework to predict how nanoparticles made of graphene, silica and rare-earth compounds behave when suspended within the center of a laser beam. Bhattacharya seeks to understand the overall parameters for creating and sustaining a quantum state with levitated optomechanics. His theoretical work will model advanced sensing designs based on the “optical tweezers” technique. This groundbreaking invention in laser physics won Arthur Ashkin at Bell Laboratories half of this year’s Nobel prize in physics. Optical tweezers use radiation pressure exerted by photons to push and trap particles inside a laser beam. The tool allows scientists to study tiny particles freed from a supporting substrate and to measure their properties without interference. 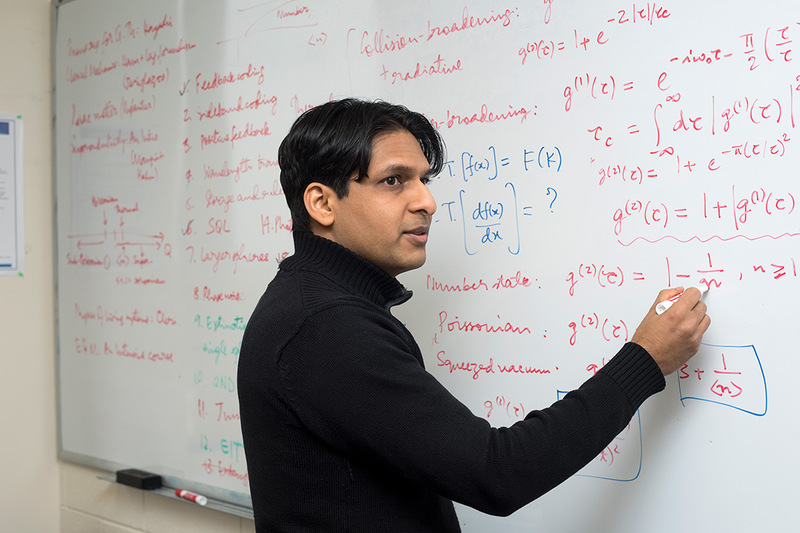 Bhattacharya’s award will help train RIT undergraduates, graduates and postdoctoral researchers in quantum science and technology. His research group consists of Kristian Feliz, a second-year physics major, and postdoctoral fellows Pardeep Kumar and Tushar Biswas. Passage of the $1.275 billion initiative would prioritize the research and development of quantum information science and technology, ensuring the United States’ leadership in the quantum sector and enhancing national security.